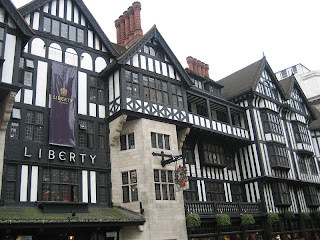 I went to Liberty of London last week for the first time. How had I not been there before? Why didn’t anyone tell me how beautiful it is? There are a number of iconic department stores in London; Selfridges, Browns and of course Harrods, but Liberty is like no other. It feels like you are walking around a country home, away from the bustle of Oxford Circus. A relaxed, unpretentious atmosphere means that you are free to browse at your leisure, without feeling in the way of sales assistants. There is a beautiful scarf room full of sumptuous silk and Liberty’s famous dreamy patterns, and a vintage area well stocked with designer delights from times gone by. I bought some jeans in the sale, grey skinnys by C.r.a.f.t. a fab bargain! The sales assistant was helpful without being pushy, and even telephoned his colleague to let me know what C.r.a.f.t. stands for (I’ll let you find that out for yourselves). Overall a great visit, although I think the bag and shoes sections could do with more choice. Personally I can’t wait for Selfridges huge new shoe gallery . . . could be dangerous. From mid September Manolo Blahnik will have a ‘pop-up’ store inside Liberty stocking exclusive shoes using Liberty prints from the swinging sixties. There will also be cushions, candles and printed fabric in the collection, plus Manolo himself will be curating Liberty’s Christmas windows. An excuse for another visit I think!